Why did African men leave their homes to work on the mines of the Witwatersrand? How did a woman searching for her husband make a life in the city? What happened to a family or community forcibly removed from their homes or their land? How did racial classification destroy families and communities? What thoughts went through a detainee’s mind during their long hours in prison? How did black people in South Africa manage to keep the fires of resistance burning under such harsh social, political and economic conditions? How did people born into such a hopeless present keep their dignity and resolve? 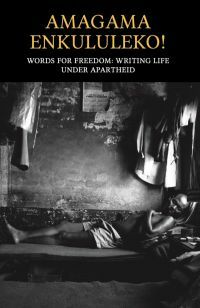 With a foreword by Zakes Mda, and a mixture of famous and seemingly forgotten struggle writers, this anthology tackles the history of colonialism and Apartheid from the ground up. Through a blend of history and story-telling, it opens a window onto the ways ordinary, everyday life was shaped by the forces of history. It displays the anger, suffering, love, joy, courage and enduring humanity of ordinary people and communities striving for dignity, freedom and justice. Contrary to what is sometimes said, in South Africa the past is not past; it is still a strong presence in people’s lives. It is not possible to understand the present without understanding the past. Forgiving does not mean forgetting. History is often written from the perspective of the oppressor or the powerful. As the saying goes, “Tales of hunting often glorify the hunter.” When we write about South Africa, it is important to tell history from the perspective of the majority, those whose voices were suppressed until the end of apartheid. AMAGAMA ENKULULEKO sets forth a representative sample of the voices of the majority’s struggle for liberation. This book includes short stories, essays, biographies, and poetry. The contributors give voice to the painful experiences of the majority from early colonialism to later apartheid. In terms of contemporary stories, we have to be careful not to hear only the voices and perspectives of the powerful in the new order, men who have an outsized platform to tell us about their role in the liberation struggle to the exclusion of smaller organizations and the many ordinary, unaffiliated people who contributed to the struggle against apartheid, often with their lives. This collection includes the contributions of people from many parts of South African society. The book is organized around six themes: Colonialism and Racial Capitalism, The Making of Apartheid, Black Spots and Forced Removals, Repression and Political Quiet, Black Consciousness and the Soweto Uprising, and Emergency and Revolt. Each section begins by grounding the reader with a useful general historical context and explaining the meaning and importance of the theme. The writing is generally powerful and touching. It is also in places very painful, but this is not surprising, considering the context. Pain does not, however, dim the hope and inspiration that informed the liberation struggle. They’re stealing our cattle on misty plains! The white man’s bounty lies in Africa. The cause of our tribulation. And they went out to dig Masaba’s grave (23. There were many things that caught my attention immediately, like the benches in the City Hall gardens which are apparently set aside for whites only but which do not have the familiar ‘Whites only’ sign painted on them. Apparently Pretoria takes it for granted that no black man would ever dream of sitting on them. But it was something else which struck me most forcibly. This was that the Afrikaner people of Pretoria seem to be more at home than anywhere else in the country. They seem to walk with a particular kind of dignity, confidence and sense of pride on the pavements of Pretoria. The non-whites on the other hand are different. There is a shuffle in their walk and they carry about with them an air of uncertainty, even apprehensiveness, as though they are wondering what the next day has in store for them (69). There are also glossaries embedded in each section explaining words and concepts that may be unfamiliar to today’s readers. At the end of each selection are questions for discussion or to facilitate further reflection, plus writing suggestions. The short biographical sketches of the major contributors are interesting. AMAGAMA ENKULULEKO! is a teacher’s and learner’s delight. It is well-organized and presented in a way that is bound to facilitate learning. This book is highly recommended for general readers and especially for teachers and learners.